From Lenore: I've spent the past 24 years as a paralegal in public finance at the law firm of Dorsey & Whitney - not exactly what I envisioned when I got an M.A. in art history. My daughter recently graduated from Lewis & Clark College, is living in Portland, OR and actually using her art degree as a preschool art teacher. My son is attending Normandale Community College, shoots video pieces in his spare time and dreams of making it big in the film biz. This will be the first reunion I've attended in 20 years and I'm looking forward to it. From joyce: I am really looking forward to this reunion especially since I will be attending with several old friends ( classmates). I was pretty lucky in high school to meet Diane Elletson who became my best friend in 10th grade and still is my best friend to this day. How lucky are we to still be close friends after ALL these years?? I retired in 2013 after 43 years of the best career ever! I was a registered nurse and later became a family nurse practitioner and taught in the graduate school at the U of M. as well as worked in a local practice. Sharing in the lives of my patients made going to work every day a privilege. I just celebrated my 45 th anniversary and count myself lucky to have raised 5 amazing kids with their wonderful father. Our eldest son is an associate professor at Seoul National U in Korea, our next son does critical care transport in San Diego and is head of a non profit. He and his wife have 2 beautiful sons. Our eldest daughter is a physician in Mpls. ( maybe she is your doctor??) and she and her husband have 4 active boys. The next daughter lives in Mpls and is in retail. Our youngest son is a civil engineer in Edina and along with his wife is expecting their first child about the time of our reunion. Ironically, they live in a house one block south and west of the house I grew up in. Currently, I am enjoying NOT commuting to work in bad weather, traveling, hiking, and helping to care for my 6 grandsons! Last year, my husband and I adopted a 6 year old black lab IED detection Marine Corp dog who served 2 tours of duty in Afghanistan before becoming disabled and no longer fit for duty. He is truly the love of our lives and seems to have been born with joy in his heart! Thanks to all who are planning this memorable reunion for us; I hope we have a good turnout. From Jeffrey: I married Brenda Gottlieb (Duluth Central '67) in 1971 and two years later Piper Jaffray moved us out to Seattle where we have been ever since. I have remained in the investment business for all of my 46 years out of college and four of us have had our own money management business out here in Seattle since 1983. Now married for 46 years, Brenda and I have a 40 year-old daughter living in Olympia working as the #2 attorney for the Washington State Department of Health, and a 36 year-old son who received his MBA from the University of Maryland and does consulting work here in Seattle. Our daughter in Olympia has our two children (ages 9 and 7). Brenda owns and operates three Sylvan Learning Centers on the eastside of Seattle which keeps both of us busy. Since my sister, as well as many friends, still live in Minneapolis, we get back to the Twin Cities fairly often. Lookin forwad to coming in for the reunion. I HAD THE PLEASURE OF BEING INVOLVED WITH THE 'LIPPS INC' PROJECT WHICH SPAWNED 'FUNKYTOWN,' AND MY FAVORITE SLP MEMORY WAS MISS CHARLES NUTTY CLASS MY SENIOR YEAR...WISHING YOU ALL WELL. From Terri: I "retired" after 10 years as Director of Entrepreneurship at St. Bens/St.Johns to start a new organization serving mission driven newer entrepreneurs with training, co-working and resource supports, called Impact Hub MSP. I volunteer as founding board member, mentor, and chief fundraiser. I also consult with foundations, families and nonprofits on improving philanthropic strategies. And I teach at Humphrey School of Public Affairs, one course a semester. I love the problem solving needed daily and the challenge of staying on top of communicating with such different generations. My definition of retirement is having 4 day weekends! 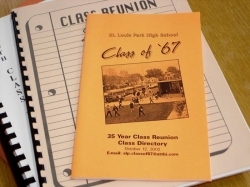 I attended the SLP Class of '66 reunion with my husband, Jim Clifford. It was great fun. I am already looking forward to ours. See you there. From Lynn: Greetings from the Sunny Left Coast! Sadly, I will not be able to attend this reunion. I want to thank all of the folks who worked to put this event together for all of us to enjoy---even at a distance. The photos and notes from everyone have been fun to look at. My life has been filled with 'wonderful' times, 'okay' times and 'not so good' times. Fortunately, the 'wonderful' outweigh the 'okay and the 'not so good'. The hardest part for me has been the loss of both of my parents and the sale, after fifty years, of our family home. My husband Barney and I have been happily married for 24 years. We are raising three sons and despite the same food, same schools and same general approach to parenting with each---they have grown up to be strikingly different young men. Our oldest son did a stint at Gustavus and returned home to continue to complete his degree in Anthropology, while he works as a lifeguard and swim instructor. Our middle son is a cadet at the United States Air Force Academy and plans to be a pilot. Our youngest son is a senior in high school and is the guitar player in a very sucessful-many paying gigs-1950's retro-rock band. For the past fifteen years I have been coordinating a distance education program for adults. We offer many classes on television, on the Internet and in DVD libraries. Along the way I finally got a Master's Degree in Education Administration, which allowed me to branch out as a consultant to other programs in the state. My office is located on a high school campus, which fills my days with the sights and sounds of teenagers and campus life which I love! My career has taken me to many schools thoughout the state. However, I rarely encounter teachers of the caliber we took for granted that we would and did find at St. Louis Park High School. We were so fortunate to have so many talented and dedicated instructors. I promise I won't miss the 50th! From Bruce: I retired last year to our lake place in north west Wisconsin. We enjoy being away from the hustle bustle of the city, but are only 90 minutes away. I still see a number of my actuarial co-workers, and after 45 years of that, I have no regrets. I visit my son in Portland OR from time to time, but see my step daughter in Eau Claire much more frequently. From Robert: I've been married 49 yrs. to Dorene from Bloomingon. We have two adult children and two adoring grandchildren, one from each. We had our granddaughter with us up north for ten summers, wonderful. She will have great memories of her summers, (helping grandma working at the Orr General Store) the rest of her life and so will we. Our daughter and granddaughter live in our home in Bloomington. Our grandson Jackson who is three, lives in Minneapolis with our son and his wife. ​I went three years to the U of Mn., four years USAF, Loring AFB, Limestone Maine. Beautiful, like northern Mn. I worked in the metal industry, help design and build hi-tech prototypes for the clean air environment industries. ACAD (computer aided desigh) substitute teacher for awhile. Retired at 54 yrs. to the cabin up north near Orr, Mn. I help start two businesses for close friends in Mpls. and helped to start two non-profits, in northern Mn., by writing up their Non-profit Corporate papers. Did some grant writing and got good at that, got every grant we tried for. Got into general contracting for home additions, improvements, garages, and outdoor sheds. ​Finally, four years ago I quit all and I'm just working on my own projects. I will never get done but at least we're having more time to do the things we enjoy. Also working on our family tree with over 12,500 words so far, I have 52 cousins. ​P.S. While reading our bios., I got a kick out of how many of us thought this was our 40th reunion. Ha! don't we wish...love it! Hi Classmates ~ I'm planning to attend with Sally H. Hundemer and her husband. Hope to see some S.B's. at Old Central Sat. 8/18/07 from 10 AM - noon so you can visit with the senior division ( that still competes). Bring noseplugs and for a small fee that Bonnie Kutzler collects you can practice, too! ~~ I volunteer for Winonah Elem Library in So. Mpls. and also Mt Olivet Home (memory loss unit). My oldest girl graduated from Mpls. College of Art and Design. The youngest is a 6th yr. senior in Madison -UW. She spent the last 9 months in Quito, Ecuador, visiting Peru, the rain forest, the Gallapagos, Indian villages, etc. The pictures were great! I've seen a bit of the USA, Mexico - (28 trips), and Europe (15 weeks so far.) Would love to live in Europe eventually. I'm hoping this reunion will have lots of last minute registrations. I do have trouble with PC's- and am not hooked up to internet in my home, so won't send a picture. I will bring old pictures from Aquila Elem from '57-'60). After an early marriage and divorce, I started a career in personnel placement in Minneapolis. After moving to Denver in 1984 for my job, I was lucky enough to meet my husband through the "Personals" (Remember those before online dating!) We've been married for almost 30 years and have a fabulous 26 year old son, and I work 4-5 days a week as a Recruiter for the National Registry of Marriage Friendly Therapists. (www.marriagefriendlytherapists.com) My son graduated Boston University in 2013 and decided to make Boston his home. He is currently working in Mergers and Acquisitions for the corporate headquartersof Staples in Boston which allows him to travel often. And yes, I'm "Mark Rosen's sister", which I get asked often. I also have a sister, Barb, who also graduated from Park. I enjoy reading, indie movies, travel, and spending time with my family and friends. I also love running into former classmates when I'm in the Minneapolis area to visit my family. My favorite high school memory is of taking the train to NYC Senior Year and rooming with Lynne Goldberg and Robbie Perl. I don't think I've ever had that much fun since! Hope this finds everyone healthy and happy. Sorry I won't be at the reunion, but I would love to hear from anyone who wants to say "hi". From Michael: After I left SLP, I bounced around to Grinnell, Antioch (fabulous college! )and Colorado State, where I began my career as a wildlife biologist, first with the US Fish and Wildlife Service's Refuges on the Lower Rio Grande and then to the lower part of the Upper Miss, known as Mark Twain, then off to the Pacific Northwest with FWS and BLM, now with the Forest Service, living in Utah. I have been incredibly fortunate to work on large ecoystems, focusing on bird biology. I am happily married to my wife of over 31 years, Teresa, and I have three wonderful daughters. When I think back to St.Louis Park H.S. I wonder how I got through - pretty unfocused! - probably on account of some good friends and the tennis team! From Michael: Sorry I won't be able to make it - I'm sure it will be quite a hoot - that coming from a now retired wildlife biologist. I retired eight years ago after a truly amazing career working directly with over 50 species of animals (including elephants) and as a wildlife ecologist, leading or involved with four of the nation's largest ecological programs, including the Upper Mississippi River Environmental Management Program; the Lower Rio Grande Vally National Wildlife Refuge acquisitions program developing a 250-mile borderland wildlife corridor; the northern spotted owl monitoring and recovery program; and the Great Basin sage-grouse recovery program. I live with my wonderful wife of 40 yearsTeresa, on the beautiful Oregon coast. We have three daughters, two who live in nearby Portland. My days are still occupied with wildlife and nature, hiking and bicycling and birding in the lush forests of western Oregon and along the Pacific coast...and I am still playing piano and reading extensively.